Two covers do not a trend make; let's get that out of the way. That said, these covers similarly portray the fearful exploration into the unknown that's at the heart of each novel. 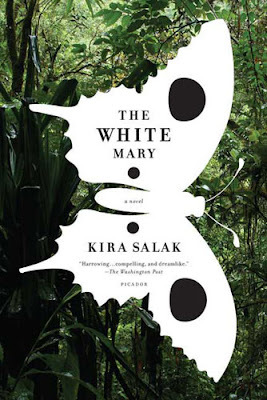 In The White Mary, a journalist wanders into the jungles of Papua New Guinea to discover the truth about the alleged suicide of of her idol; in Castle, a private, awkward man buys over 600 acres in NY state only to discover there's someone living in the middle of his oasis. Castle is definitely creepier, but both toy with representation and the anticipation that it brings to great effect. Can anyone point out similar examples? There's also Abandonment by Peter Rock: http://powells.com/biblio/18-9780151014149-0 .. which is similar to the second but different in perspective.. Both strike me as a little excessive. Then again if I had the chance to redesign them I would probably keep "improving" them until they were just black text on white. Josh, I was going to say the same thing, except it reminds me A LOT of silhouette masterpiece theatre. This is a non-fiction title, but with the same theme of exploration of the unknown. *Disclaimer...I think it is a good example, but thought I should let you know my affiliation, as an employee of the book's publisher. Keenan did Mailman by Lennon so perhaps Castle is one of his? We published this earlier this year in Canada. The Sudden Disappearance of Seetha. 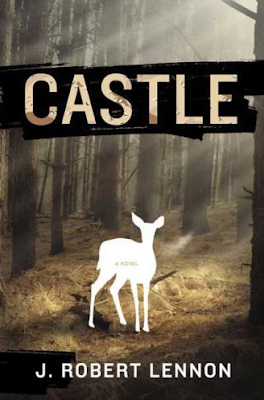 Lennon here--CASTLE was designed by Kyle G. Hunter; Graywolf, my publisher, ran a few drafts by me. I quite like it! There is an actual white deer in the novel, but it was the designer's idea to make it a white silhouette. I don't know how long this artist has been around or if maybe they did these covers. The Harvard Business covers in the previous post show some similarities. THE WHITE MARY is designed by the awesome Kelly Blair. MY ABANDONMENT makes a little more literal since, as the main character carries a white toy horse throughout the novel.